So what is beautyrokz all about? WE ONLY DO SPRAY TANS……….....BUT WE DO THEM BRILLIANTLY!!!! We are about CHOICE & CONVENIENCE!!! Choose WHEN you want a spray tan. Choose WHERE you want it. Choose a time CONVENIENT to YOU. Choose a colour to suit your skin tone, occasion or budget. WE COME TO YOU & BRING THE SALON IN TO YOUR HOME. We have an amazing 12 products to choose from the brands below. We have Loyalty Cards as well! All this means that whatever your schedule, family or work commitments, we can work around you to fit in a beautiful professional spray tan. Fully qualified & insured, with over 8years experience. My clients are my number 1 priority & I will do everything to work around their needs, & requirements all the while providing a great service (I hope). I am constantly trying to improve at Beautyrokz, with new products, learning advanced techniques, swotting up on trends & investing in new technology. 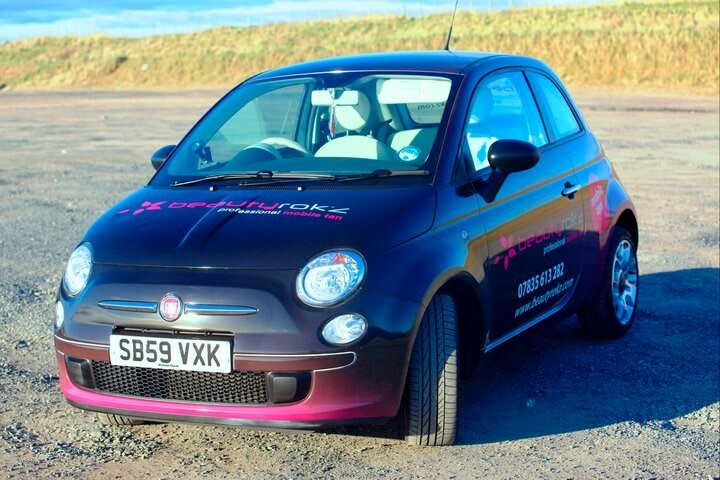 Wee Chico is my baby and an integral part of the Beautyrokz machine. If you live in 1 of the smaller towns in Ayrshire (I have stayed in Ayrshire all my life) it may be more difficult to fit in an appointment or even get to the salon. That’s when you can call me. After approx 15miles there may be additional travel supp*. We travel all over Ayrshire with most of our clients in Prestwick, Ayr, Kilmarnock, Irvine, Troon, Kilwinning, as well as every wee town and village up and down the beautiful ayrshire coast. So if you are looking for a beauty salon near you that does tans, you cant get any nearer than your own home, give me a shout. its always super relaxed (its in your house) and once its done you can slip into your comfies and no need to risk that tan getting back home. Below are all the towns and incurred charges for certain areas further from our prestwick base. Try to keep you up to date with what’s happening with Beautyrokz, special offers, freebies, tanning tips, news, new tan trends and all things tanning. Feel free to follow, like, comment, re-tweet, review, favour, plus1 or pin it (holy jebus have I missed any out) I will happily respond as best I can. That’s us in a, rather bigger, nutshell than expected, but hopefully it sums us up.